After a slow start Over the Hedge hits its stride and pulls out a fantastic finale. A resourceful raccoon, RJ (Bruce Willis, The Fifth Element) uses all the tools in his arsenal (including a golf club and a dinosaur-head grabber) to get grub out of a broken vending machine. Unable to snag his prize bag of chips, and without much choice given the barren wasteland surrounding him, RJ heads up to a sleeping bear’s den to raid his storehouse. On the verge of a successful heist, greed gets the best of RJ and he goes for the package of Spuddies brand potato chips tucked under the grizzly’s arm. With the bear’s huge stash of snacks – all of it unnaturally flavored – conveniently piled high on a little red wagon, RJ sees the invaluable treasure trove careen down the mountainside and roll to a stop squarely in the middle of the road below. Within moments, the whole collection is street pizza, flattened out by a semi. RJ strikes a bargain with the understandably angry – and now wide awake – Vincent the Bear (Nick Nolte, Hulk). He’ll replenish Vincent’s cupboards with potato chips, candy, cookies - all the stuff that’s bad for your average bear. And he’ll even replace the destroyed red wagon and blue cooler. Vincent has generously given him one week to do it. RJ will make more mistakes in that time. And It Shall Be Called… Steve! While on his quest to find food, RJ stumbles on a whole crew of animals, some furry, some prickly, some stinky, and some amphibian (or is that reptilian?). Spring has sprung and the ragtag group has come out of hibernation only to face their own adversity: a huge hedge was erected around their peaceful turf while they were sleeping. They’re now hemmed in by the massive covenant-controlled housing community known as El Rancho Camelot Estates. Having named their newfound barrier “Steve” (Steve’s a nice name, after all) and spurred on by RJ and his need to feed, the group takes a gander at life on the other side. It’s a terrifying world of SUVs, manicured lawns, Persian cats, and satellite dishes. Enticing the clan of anthropomorphic characters with the explosive taste from a bag of tortilla chips, RJ is quick to get their buy-in on a mission to “the other side.” All, that is, except for Verne the Turtle (Garry Shandling, Doctor Dolittle). Verne’s the quiet, thoughtful one and when his tail trembles, it’s a bad vibe. Verne notwithstanding, RJ seizes the opportunity and enlists the assorted talents of the Camelot collective to help him… er, no, them… gather food. Along the way, the obvious jabs at mankind’s lifestyle and impact on the environment are made, but the movie doesn’t truly achieve liftoff until the inspired conclusion pulls out all the stops. 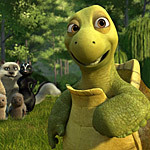 Unlike DreamWorks’ Shrek movies, which offered a nice mix of different kinds of gags to keep the older audience members as entertained as the youngsters, Over the Hedge, which is based on the newspaper comic strip of the same name, primarily uses sight gags to keep the attention of grownups. One of those jokes is even downright mean spirited. In that instance, a John Tesh CD is found amongst a bunch of other yard sale junk. Making matters worse, it’s been written on in red marker: 10¢. There are some other jokes geared toward adults, such as one directed at Dr. Phil and a couple regarding gas-guzzling SUVs, which have, according to RJ, become popular because people are starting to lose their ability to walk. Topping it off, those massive SUVs, RJ states authoritatively, typically hold one person at a time. Amidst the mayhem, the critters have to contend with several humans. Among them, a Type-A homeowners association president (Allison Janney, Finding Nemo), a couple Trail Guide Gals (think Girl Scouts), and the evil Dwayne the Verminator (Thomas Haden Church, George of the Jungle). Unfortunately, more than 10 years after Toy Story gave humans a creepy, inhuman look, the technology hasn’t advanced enough to make the humans in Over the Hedge anywhere near as lifelike as the endearing animals. Verne the Turtle’s knees are finely detailed, for Pete’s sake, but Gladys from the homeowners association still looks like a stiff plastic doll. The animators come closer with Dwayne, the proud holder of an associate’s degree from Verm Tech, but even he’s not nearly as detailed as the movie’s darling porcupine family whom, based on their vernacular and that familiar accent, must hail from Fargo, North Dakota. Aside from that technical challenge, Over the Hedge provides plenty of good entertainment for the kiddies and also manages to be a tolerable movie for the parental units. The typical messages about the importance of family, loyalty, and honesty feel a wee bit tacked on, but at least they don’t come across as preachy. The movie also manages to poke fun at familiar brand names by playing off them instead of using full-blown product placements. The blue cooler, for example, was made by “Cold Man.” Granted, there’s one major placement that serves as a decent gag. While raiding Gladys’ house, one of the critters falls on the TV remote, turning on the home entertainment system and starting up the – very loud – THX Sound System clip. At least they kept things in the Spielberg/Lucas family, with Skywalker Ranch providing sound work on this production from Spielberg’s company. On the down side, the couple songs supplied by Ben Folds are painfully saccharine, and of a very generic variety at that. Making up for that weakness is a solid voice cast that also includes Avril Lavigne and William Shatner as Opossums and Steve Carell as Hammy, a hyperactive squirrel. Hammy plays a major role in the movie’s wiz-bang conclusion, one that starts with a well-done gag involving an impromptu map of Gladys’ backyard and the numerous traps installed by Dwayne. From there, the chain of events unravels at a fast and furious pace in what amounts to some truly classic stuff. If the rest of the movie shared that same energy and ingenuity, this one could’ve ranked higher in the CGI pantheon dominated by Shrek and The Incredibles.